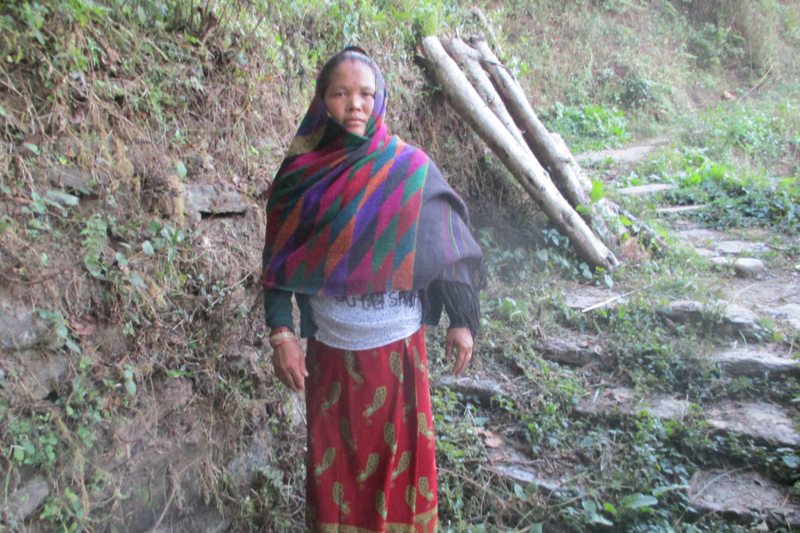 Kalimaya Gurung from Ajirkot-1, Ghhyachok Thum gaun Gorkha is a house wife with 8 family members. She is from disadvantages janajati family and depending on daily wages for survival. As CCODER Nepal started to work in Ghhayak she was motivated and became the member of cooperative and started saving. Though she became the member of cooperative but was difficult for her mange regular saving in cooperative. She had no other way of income and was frustrated with her regular traditional business, i.e. cultivation of maize, millet, potato etc. She was eager to find alternative or a productive business to manage her regular household expenses. At the same time, 9 months ago CCODER Nepal started goat raising program for Ghhyachok to support livelihood of very low-income household. Kalimaya as a very low household income women selected for the support of goat raising program. Under the project CCODER conducted a training of goat rising with entrepreneurship development skill for the community members. She joined in that training. Then she also received 4 goats as a motivation/ incentive from the program. 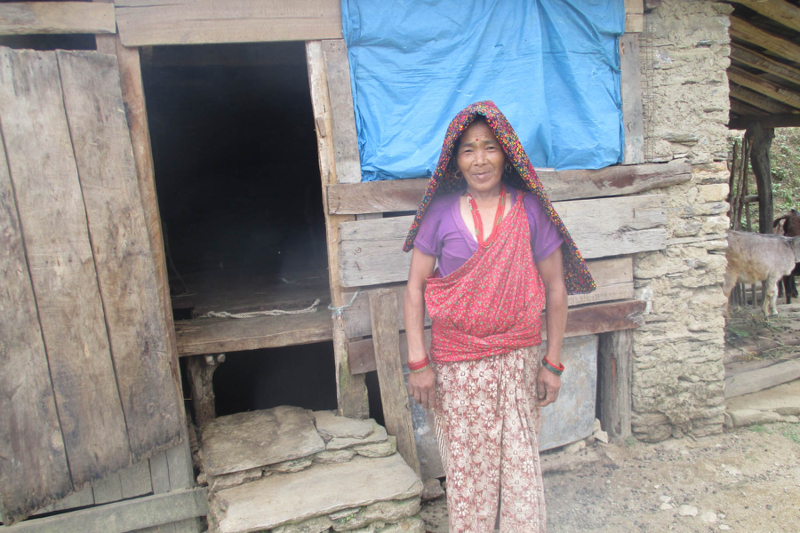 She constructed a goat shed with the support of project and her individual contribution. She was happy with this support and work hard for goat farming. Now she has 8 goats. This is the good signal to extend her business. In the near future, she is expecting additional income which helps to continue study for her children and manage other regular household expenses of the family easily. She says, “CCODER Nepal has explored me this best option to be self-dependent in my own village. I am so thankful to CCODER Nepal and also I want to spend my time to make and inspires other women like me for their financial independency.” CCODER- Nepal is also hopeful to empower community members creating like this self-employment opportunities. 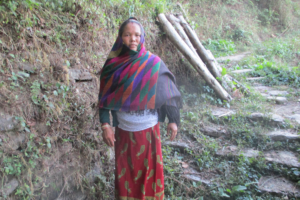 Muga Gurung from Ajirkot-1, Ghhyachok Thum gaun Gorkha is a house wife with 5 family members. She is from marginalized called Janajati family with very poor financial status and depending on traditional agriculture for survival. She is earthquake victim family of 2015. She lost her one daughter in earthquake. With the inspiration and support from CCODER-Nepal she joined community group/ cooperative and also started saving. A daily life with scarcities in daily livelihood was the frustrating/ dark part on her life. Though getting indirect support for loan access, seed support for agriculture, bedding or clothing support doesn’t hold a satisfactory value as it is just an immediate support. Right after the destructive Earthquake the wheel of the time turned left for her with the loss of her daughter. She again had to bear further stress and difficulties in her life. With this collective voice of demand on additional livelihood support NSPL-CCODER introduced livelihood support project through Goat keeping. She was a part in this project. She received training, incentives for making goat shed and 4 goats including other supports for fodder and forage as basic prerequisites for goat keeping. Now she has 7 goats. This is the good signal to extend her business. In the near future, she is expecting additional income which helps to continue study for her children and manage other regular household expenses of the family easily. She says, “CCODER Nepal has explored me this best option to be self-dependent in my own village. I am so thankful to CCODER Nepal and I also want to spend my time to make and inspires other women like me for their financial independency.